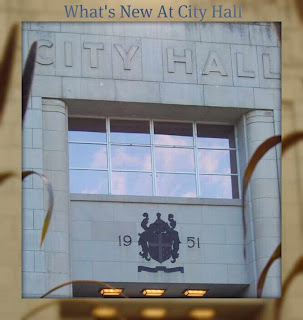 This page will highlight current City Hall News only. 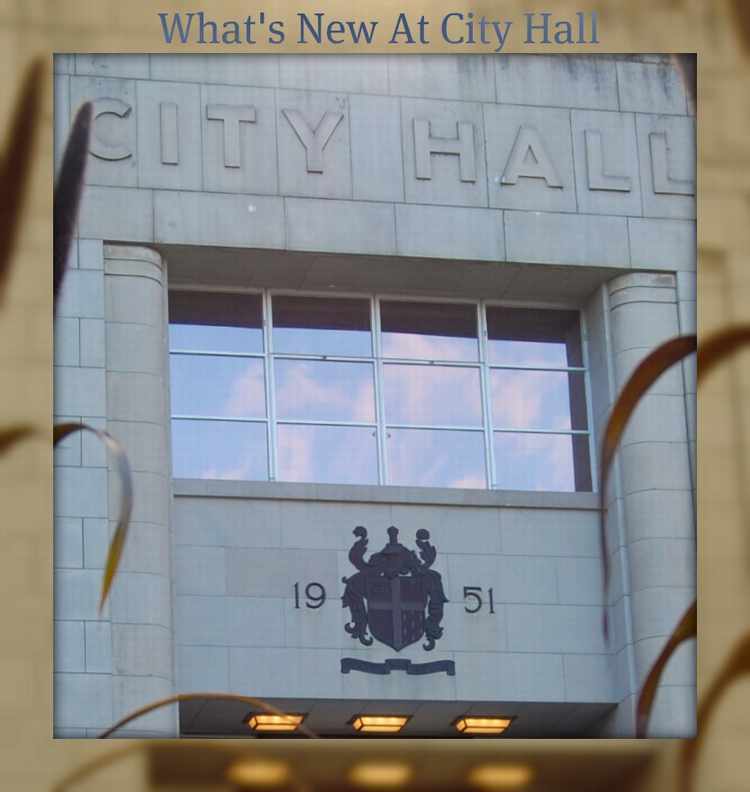 Articles appearing on this page also appear on the main page of Nanaimo Info Blog, but if you are not wanting to sift through other local news and events to find the latest from City Hall, this page is for you. Follows is the list of employees earning in excess of $75,000/yr and the summary of all employees total remuneration including city council. This list also reports expenses claimed by council and staffers. This report does not include approximately $19 million which is paid to the RCMP. Since they are not considered direct employees their wages do not appear on this document. 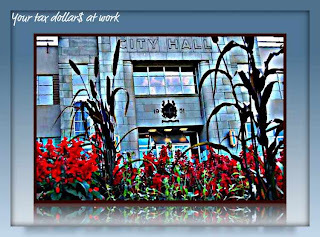 Taxable benefits paid to city staff is also not reported. Note: Clicking on the image will enlarge it making for easier reading. You can also increase the image size of your browser in some cases. The recent events at city hall really call into question what kind of leadership Mayor and Council and Senior Management are capable of delivering to the Nanaimo taxpayer. Perhaps Nanaimo is really still just a small town, with big city ambitions and none of us knows how to make the transitition. Having been educated and spent all our working lives here, we have just basically been making this up as we go, hoping we are making the right decisions. Another possibility is that the 'Peter Principle' does in fact have some merit. The Peter Principle is basically the idea that within organizations people keep being promoted based on their ability to achieve success at different levels. Eventually however, they are promoted to a position in which they are incompetent, where they remain. Sadly, those we charge with overseeing how our city is run, do not have to prove competence on any level. In fact, becoming a city councillor is far more about personality, appearance and the support of special interest groups and little to do with competence. Regular observers of city council should have little trouble agreeing with the argument, that competence has little to do with sitting on city council. This is the first in a series of short articles that will examine some serious questions about the levels of competence being demonstrated by city council and senior city hall management. What's The Story Behind Missing/Leaving Staff? It was mid-March I believe when we last saw the newly hired head of Legislative Services, Ms.Tracy Samra fulfilling the duties of the Officer of the Corporation mandated by the Community Charter. Hers' is not a discretionary position but is mandated. There has never been any clear explanation as to why Ms Samra went on 'administrative leave' but there is lots of speculation swirling around the rumor mill as to why she was removed from the scene so soon after assuming her office. The importance of this office Ms.Samra occupies is not to be taken likely, as ultimately she is responsible for seeing that city of Nanaimo business is being conducted in a proper and law abiding fashion. As a lawyer, Ms Samra would likely have superior knowledge as to legal procedure when compared with senior city hall staff such as Mr. Holmes or Mr. Kenning. This current administration under Mayor Ruttan and Mr. Kenning has come under criticism on many occasions for questionable misuse of the in-camera process. Whether all meetings this administration have conducted in-camera still need, or ever needed to be in secret is something this scribe has found troubling for quite sometime. For example, we still don't know which councillors voted to spend $16,000,000 on that shiny new office for staff. We still don't know what kind of information city staff provided council with, when they voted to remove Colliery Dams. We do know they were told the price to replace could be a staggering $30,000,000 and the dams had a 40% chance of failure. Many months ago Councillor Bestwick asked for a report from staff which would show which in-camera meetings going back to 2010 could be brought out of in-camera. This is a job that Tracy Samra would have been tasked with and I would imagine that before March of this year, she would have completed that task, given the priority it should have been given. Since we still have not seen the report which was requested over six months ago and the person tasked with preparing it has been missing for nearly four months without explanation, one has to wonder if there is a connection. Speaking purely speculatively if the in-camera report prepared by Ms. Samra would indicate some in-camera meetings be made public, and for reasons unknown, city management did not agree could that have accounted for Ms. Samras' sudden disappearance? Once again this city council demonstrates why they are completely redundant. Think about it, when was the last time they did anything except put a rubber stamp on what city staff recommends? 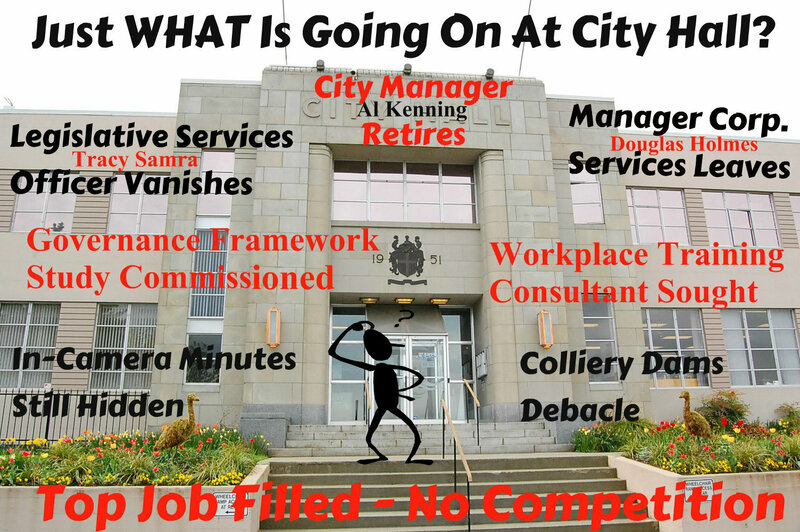 The latest appointing of Mr. Swabey as city manager, on the recommendation of Mr. Kenning, I understand, is yet another reason to simply abolish council altogether and elect the top managers at city hall instead. 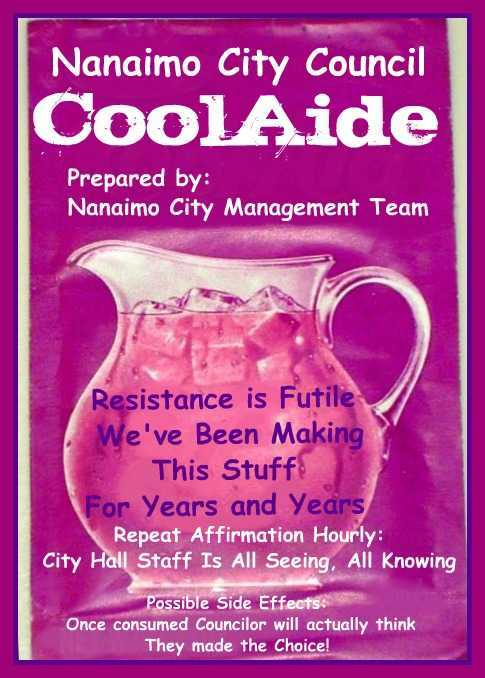 If city council puts all this blind faith in city staff, they (council) are really redundant and we should be saving the $300,000+ a year they cost Nanaimo taxpayers. Since our 'professional staff' are among the highest paid in the Province of BC, what exactly are their qualifications as 'professionals'? You will notice that on all of our glossy city of Nanaimo information, it is impossible to find a page listing the bios of our highly paid, professional staff. Why is that? Anyone with more than a passing interest in how qualified our chief managers are might want to do a little research and perhaps ask their favourite councillor why they think that hiring from within, and training on the job, is good policy. I believe that Mr. Berry came to the city of Nanaimo and improved himself by taking courses at Malaspina College and learned the job of city manager 'on the job'. Mr. Kenning I believe is an accountant who was appointed city manager when Mr. Berry took his golden handshake (who put those cushy deals in place?) and decided to take an early retirement. Mr. Kenning also has been learning on the job with the $16 million new annex, the $1 sale of the old annex and the Colliery Dam, $30 million to replace, projects to his credit. Enter Mr. Swabey, whose credentials aren't published either, whom we presume will be another city manager engaged in the 'learning on the job program' this city council seems to embrace. Am I the only one who has a hard time swallowing the fact that out of 9800 employees in the 'local government' segment in the entire province our own city manager ranked 46, and we have to hire from within, and then provide on the job training? 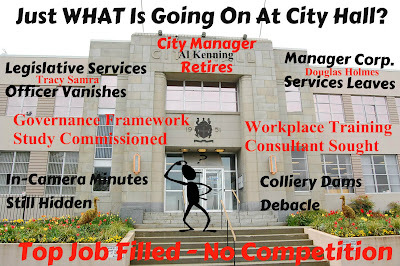 One other explanation for not going to an external job search is the fact that this council is simply not competent when it comes to being able to judge the qualities needed to be a good city manager, and so once again they rely on a staff recommendation. Tell me again, why we need this city council? At the electronic town hall meeting I posed the simple question of members of council to give an example of one way they were considering reducing property taxes. Remember there was about 30 minutes left in this meeting and the Mayor and the moderator used a shortage of time to avoid offering any answer to a very basic question. Councillor Anderson took a stab at the question, and what he said reveals something of his thought processes. Remember at this point this council had this $851,000,000 financial plan in their hands for over three months, and apparently they had not given any serious thought to how taxes might be controlled. 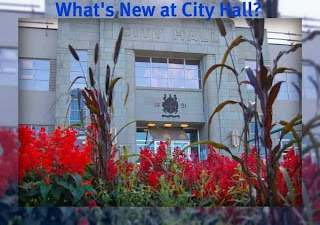 The following video is a clip from my presentation to this same council offering several ways the budget increase could have been greatly reduced, or in fact eliminated entirely. The above information is taken from the SOFI report which is to be presented at Mondays' council meeting. You may be interested to know that nearly 200 folk at city hall are making (note I did not say earning) over $75,000/yr. with a large number of those in the $100,000+ club. As near as I can determine, when it comes to establishing wages at city hall for the exempt staff and senior management, they lock themselves in a closed room and ask each other if they deserve more money based on fairy dust and tea leaves. 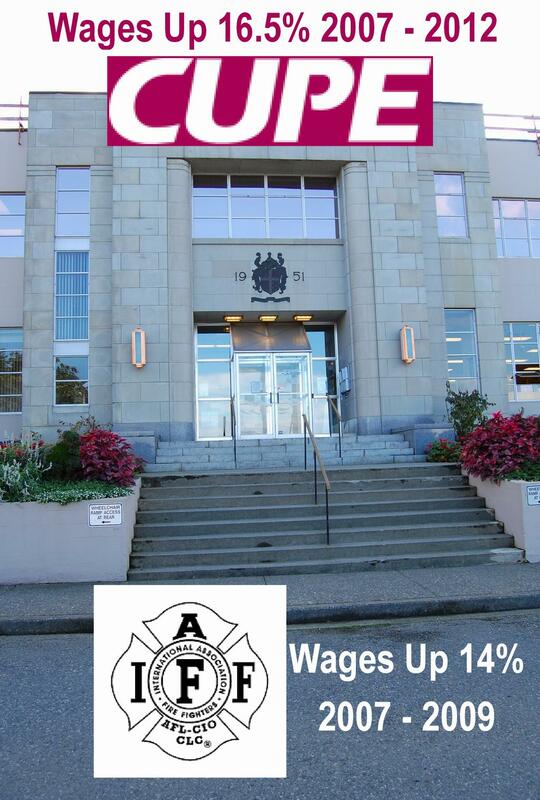 The following are the wage increases you city council have agreed to since 2007 for both CUPE and IAFF employees. The increases following are for wages only and do not include any 'hidden' increases such as benefits etc. It is safe to say, your city council has been agreeing to some pretty generouus settlements given these employees were already making well in excess of the 'average' Nanaimo income. In most cases, individuals working for the city earn in excess of the average household income in Nanaimo. + 2.5% - 2008 Oct. The source for these increases was the five year financial plan 2012 - 2016 on the city of Nanaimo website. I am waiting to hear what the IAFF increase is from 2009 onward, but I am assuming at the very least it will match the CUPE increase. 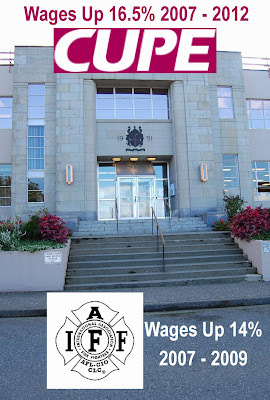 To sum up CUPE workers have been given a total 16.5% increase from 2007 - 2012 and IAFF workers have been given a 14% increase from 2007 to 2009. It is unlikely that given the economic climate since 2008, few private sector employees have received anything approaching these levels of increase, as their employers have to compete in the market to simply stay in business. On the other hand municipaliies have no such constraints on their wage packages, as they simply raise taxes. You could likely make the argument that given the increases enjoyed by these unions, it would not be unreasonable to have seen a 0% increase these past two years. I would suspect such a suggestion might meet with strong resistance from the union sponsored councilors. The public sector is the last bastion of generous union wage and benefit increases, as they simply are not affected by the same pressures the economy brings to bear on the private sector. The above chart shows by employee group just how many average sick days were paid for in the year 2011. The first group are CUPE unionized workers who averaged 13.42 sick days for the year (more than 1 each month) for a total number of 47,697 hours of pay costing taxpayers a total of $1,298,920.68. The average paid per hour to stay home = $27.23. The second grouping is IAFF (firefighters) who averaged 10.32 sick days for the year (just less than one a month) for a total number of 11,428 hours at a cost of $410,664.69. The average paid per hour to stay home = $35.94. The third grouping are the management and excluded employees who are clearly the healthiest of the lot who averaged 5.46 sick days (less than half a day per month) for a total of 3.739 hours at a cost of $172,711.52. The average paid per hour to stay home = $46.19. If you consider paying for 8381 days of sick time, it is the equivalent of putting 32 people on the payroll for an entire year, and they never show up for work. According to union agreements employees can accrue 18 sick days per year and unused sick days can be 'banked' and 'cashed in' upon retirement up to a total of 60 days. The City is concerned about sick leave usage and are taking a number of steps to reduce it. Comment: These are some of the questionable benefits that your tax dollars are going to support which add considerably to the taxes we all must pay. For example the total cost of sick leave represents a number equal to 2% of your total property tax bill. At this point I have no comparative statistics to compare number of sick days in the private sector but from my close circle of friends can think of no one, who is sick one day each month. There does seem to be a wide range even within the city as to the number of sick days that are being taken. Clearly the management and excluded staff are much healthier than the CUPE employees. I was also surprised by the sick leave taken by firefighters, as I have always thought of them as being exceptionally fit individuals with rather strong constitutions. Of course one of the flaws with the whole system is when sick pay becomes an entitlement and is used to extend a weekend or other occassion which does not actually mean the benefactor is truly sick. They are just picking up the phone and calling in sick, and then perhaps honing their golf game. There really is no incentive not to. In spite of reporting the most number of delegate days since opening, and optimistic reports for future conventions it seems the conference centre is just the gift that keeps on giving. One item highlighted in the Financial Plan presented by city Finance Director Brian Clemens itemizes an 'increased subsidy for VICC - ($234K)' as one reason for increases in the 2013 budget. You would have been forgiven for thinking that the higher number of delegate days, may have resulted in the conference centre being more profitable and therefore might result in a reduced subsidy from city taxpayers. If that is what you think, you might want to ask Mr. Howat to explain to you just what kind of an operating agreement he negotiated for you when this contract was renewed with the current operators. Frankly, I think the operators wrote it years ago, and Mr. Howat and Mr. Kenning just signed whatever was put in front of them, remember this is another one of those 'sole source' decisions made by the brain trust at city hall. Our shrewd business types at city hall, also gave the operators the option to renew for another 5 years which meant we still could not call for a tender to see if another operator would run the centre for less. I sometimes wonder, if any of these fellows ever ran a lemonade stand as kids, or operated a paper route. I have my doubts. If you want to know just what kind of a deal the operators have with the city, don't bother asking a city councillor as you will get that blank, doe in the headlights look. They can't figure it out either. 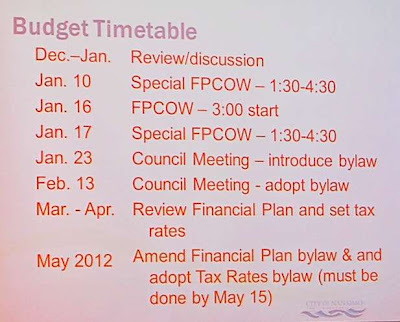 Finance Director Mr. Clemens gave council and Nanaimo the first look at his financial plans for Nanaimo going forward. As could be expected taxes are once again increasing to meet the constantly increasing spending policies adopted by council and the city manager. The residential tax increase is 3.3% and when combined with user fee increases the combined increase to a Nanaimo resident is a 4% increase, which does not include any school, hospital, library or regional district tax increases which may also be coming. With the increases proposed for residential tax increases plus the increases for water, sewer and garbage a person living in a $350,000.00 home can expect to pay another $96.82 per year, plus any increases that may be assessed by the school district or the hospital. In the final year of shifting the tax burden from the industrial tax base to the residential tax base (that is you and me brother) industrial taxes will be reducing this year by a further 16.4% which was a policy council and staff implemented in an attempt to make Nanaimo attractive to industry. As of this report there is no data to measure whether this tax shift has had a positive impact on the industrial tax base in the city. I'm not sure how far down the rabbit hole you would have to go to find material like this, but in Nanaimo it seems to present itself with great frequency. 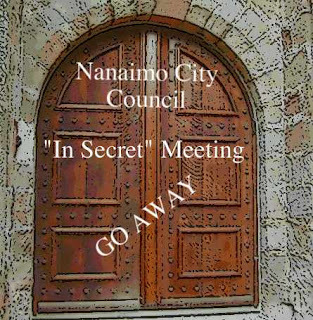 Unless you have been living in a cave, or simply ignore what goes on at city hall in order to preseve your sanity, you must be aware of the controversial $16 million decision council and staff made behind closed doors last year, to build a shiny new office for city staff. 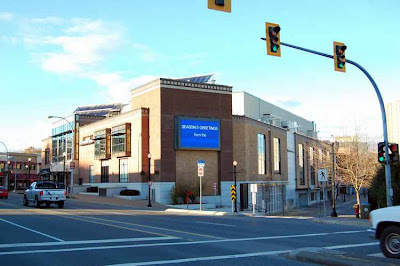 It seems that spending $4 million to upgrade the existing annex where all city staff are currently housed during working hours was not considered to be a sound expenditure of your tax dollars, so they opted for a $16 million option complete with a $12 million contract to build a new building without going to tender. As it turns out, the staff at city hall have already outgrown their new $12 million shiny new office before they have even moved in. It seems a portion of the $800,000 renovation at city hall is to make room for the city manager's office, human resources and payroll who will not be housed in the new city hall annex. You might be forgiven if you would have thought that after spending $12 million on a shiny new office, it would at least have enough space to accommodate the staff currently working out of the old city hall annex. But, then again this is the city we are talking about here. Had they bought the Dunsmuir Building for less than $7 million they would have had room for everyone as it came with over 70,000 square feet whereas the new annex is around 45,000 square feet for $12 million. 1. Stay put in old annex and roll the dice on the 'big one' like everyone else in town. 2. Spend $4 million to upgrade to newer seismic standard. 3. Spend $7 million on 70,000 square foot office complete with parking lots etc. giving enough room to house all existing staff and have room for expansion and also surplus space to rent out. 4. Spend $12 million (without a tender, no telling what the building is really worth) to build a shiny new office which does not have enough space to accommodate all staff in the old annex. 5. Spend another million or so, fixing up the existing city hall so the city manager can have a shiny new office in the perfectly good, but old city hall. Which was good enough for everyone else until the city manager discovered there was no room for him in the shiny new office. You Could Write This Stuff! 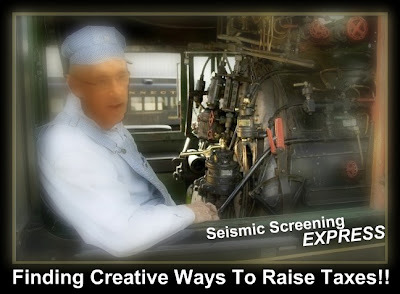 Five or six months in the making, meetings with citizens, business and civic leaders and $120,000 produce a document which is likely just the basis for more creative tax and spending on the part of your elected and non-elected rulers. Enhance the Waterfront: this means our waterfront is one of our better features and we should work to make it more attractive and more assesible to more people. Something that Nanaimo has been doing for as long as I have lived here. One of the oft heard suggestions is to extend the seawall from Departure Bay to the Estuary, sounds like a great idea, but at what cost? Manage the City's Assets: Since Nov. 2010 it has been known that the city of Nanaimo, with the knowledge of city staff and city council have been underfunding our water, sewer and roads to the tune of some $12.5 million annually. Why? Perhaps it would be harder to build a shiny new staff office if our water, sewer and roads were being taken care of. It is good to have a strategic plan, as Mr. Kenning said in the last financial report: it is virtually impossible to set priorities and structure an organization without one. Perhaps not having one for these past decades could explain our current condition. In Nov. 2010 it was revealed we are not funding our water, sewer and roads to maintain current service levels, and to do so would mean a tax increase of about 15 - 16%. Now, that we have a strategic plan which identifies asset management as a priority, city hall management will take is as seriously as they take providing themselves with shiny new offices! Or maybe not, only time will tell. City Staff recommended to city council that they attach a covenant to the sale of the old city Annex building requiring a new purchaser to either demolish the building or do a seismic upgrade. The skeptic in me sees this whole move as a bit of political gamesmanship designed to demonstrate that building staff a shiny new $16,000,000.00 office really was all about safety and not about satisfying the egos of the 'kings' at city hall. By applying a standard that they don't apply to any other building in Nanaimo to this one building, insures that the building would have no commercial value, when in fact it does have a value of about $3.5 million. The hypocrisy of this policy is the fact this standard is not being applied to the other existing civic buildings in Nanaimo. In fact even the Province does not apply this same standard to the Parliament Buildings in Victoria. This policy does not apply to all other buildings in Nanaimo either, so saying this is all about safety and concern for the public does not even pass the smirk test. To be legitimate at all, this city council needs to pass a bylaw mandating this same level of seismic standard be applied to all civic buildings and at the very least all office buildings and any other place where more than 10 people assemble at one time. Again that skeptic in me can't help but wondering if city staff really wants to discourage the sale of this building for fear someone might come along and do an engineer report and cost estimate that shows it would not cost anywhere near as much as the $4 million they claim it to cost. Remember, this is the same bunch that chose to decide behind closed doors last year, to spend $16 million on a new building rather than spending $4 million on a building they have now basically made useless. When asked if the city's lawyer had recommended putting the convenant on as a condition of sale, the staff member answered in one of those slippery fashions, saying that yes, they had a lawyer help them write the convenant. When asked again later, if the lawyer had recommeded the convenant be put on title, the same staffer fessed up an said, no, the lawyer had not suggested putting the covenant on, but rather staff had initiated that idea. This whole Annex deal, smelled right from the start, and to this day, it still stinks. You might think that city councillors are hard at work trying to follow the cue coming down from senior governments who keep preaching fiscal restraint, but you would be mistaken. 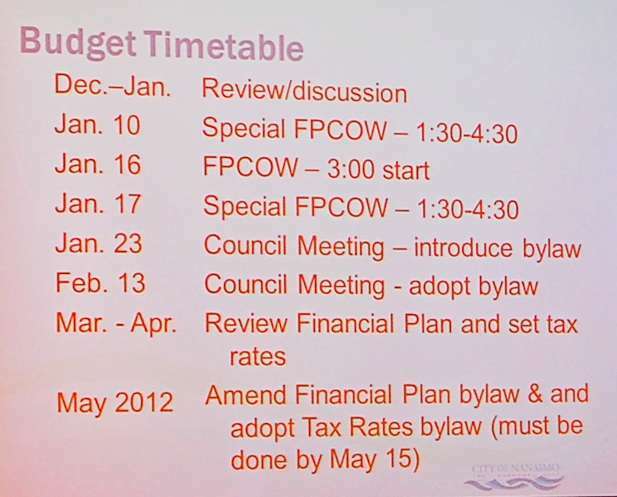 It seems like only yesterday at an FPCOW meeting Councillor Brennan led the charge to spend another $700,000 even though the city manager recommended against it. Funny how these things seem to 'slip' in at the untelevised FPCOW meetings. At the FPCOW meeting of April 2 council once again demonstrated their desire to dig a little deeper into your pocket, this time to fund what could be described as poor management at the Port Theatre. 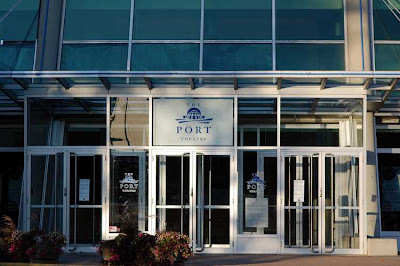 It is not really clear just how much more the city has agreed to pay the Port Theatre Society to manage the facility, but there is one item in the new agreement that is clear, and that is an increase of $15,000 for the management fee for 2012. Then there is another 2% annual increase for the term of the contract. Just how much this totals was not made completely clear. Councillor McKay asked about funds being put into an endowment plan (a fact that had been lost on council until I brought it to their attention) and why those funds were not used to fund the operating shortfall. In other words the Port Theatre has collected $45,000 last year which they are choosing to put into an endowment fund, which no one clearly can tell you the return on, an amount that would more than offset the $15,000 the city has agreed to give them. So, short version, the Theatre is taking in more money than they are asking for, but are CHOOSING to put in into an endowment fund and city staff and city council are in agreement with them. I doubt if any members of council actually read the financial statements presented by Port Theatre management, and it is so much easier to just say YES, when it is someone else's money you are spending. The next time the Mayor or Councillor tells you they are trying to hold the line on your taxes, ask them to demonstrate ONE thing that proves what they are saying! What seems to be lost on this bunch, is that every time they say yes to some 'good' project, they are just increasing YOUR taxes again and again and again. Yet Can't Issue Permit For Food Trucks!!! As if we need another example of business ineptness from city hall, you would think the conference centre would be evidence enough, city hall should stick with water and sewer and roads. A recent article in the local Daily highlights the difficulty a young entrepreneurial couple have had trying to get a permit to run their food truck at Departure Bay Beach. Short version, they applied for the permit last September, they still don't have a permit so are taking their business venture up to Parksville. If it is as successful as one might think, that is the last we will see of those enterprising young people. At the same time we are spending $1,500,000.00 funding the new ( or at least reinvented) Nanaimo Economic Development Corporation for the purpose of attracting new business to Nanaimo. Am I the only one who sees the contradictions here??? Apparently while we are plotting to attract mega employers to set up shop in Nanaimo, giving away taxes to get hotels built and billing ourselves as a tourist destination spot, our own city hall aided and abetted by city staff and a dosing city council are doing our very best to discourage even the most basic of enterprise. We are also spending $121,000.00 to develop a 'Strategic Plan' to solve all our ailments, I wonder if they will be recommending removing business oversight from the folk at city hall who I am certain are very competent at looking out for water, sewers, roads and garbage pick up, but are woefully inept when it comes to free enterprise. I realize that the office of Municipal Auditor General is not operating yet, but I have an excellent project for them to thoroughly investigate in the city of Nanaimo. 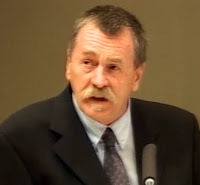 If any example of how a municipality has handled, or mishandled public funds this could very well be the poster child. What was the TRUE actual cost to construct this building? How many comparative tenders were received before contract was signed with the general contractor who build this project? How much was posted as a performance bond when this project was undertaken? What happened to the $3,000,000.00 project management fee? Was the retail space sold at actual cost to construct? What was the tax revenue this site produced for the city before this new building was built and how much does the same 'footprint' produce now? How many management proposals were entertained before striking the contract with the current operators of VICC? What is the current market value of this building? How much does the city subsidize the current operators of this complex? More Money Needed Or Better Management? 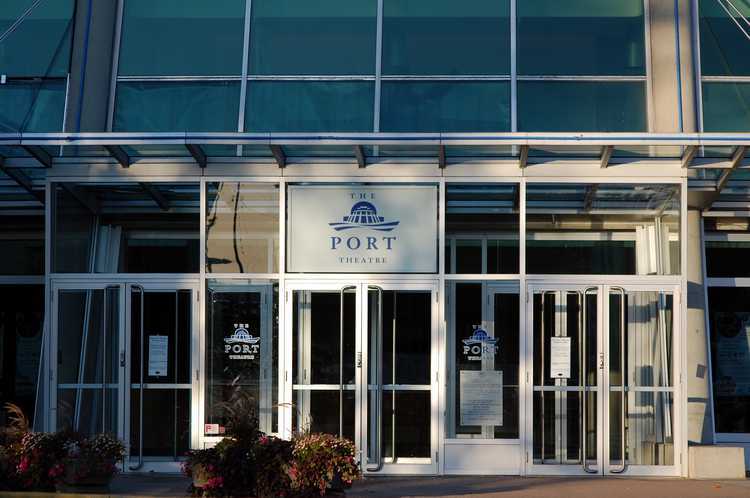 Recently the manager of the Port Theatre made a presentation/appeal to city council for approval to use some capital funds to finance an operating deficit, and also wants council to approve an ongoing increase of the city subsidy by $90,000 per year. It is claimed the extra funding is needed if the Theatre is going to be able to keep supporting the arts community as they originally intended. That raises the issue of whether it is a lack of funding or management skills that have led to the current desire for more city funds. An examination of the financial statements of the Theatre Society for the years 2006 - 2010 would indicate that before amortization and capital expenditures the theatre has shown an operating surplus of nearly $1.7 million. You might think that with proper management of these funds, the current 'crisis' could be avoided. There is also the matter of the 'Presents Series" which basically are events the Theatre Society brings to town where the society is exposed to all the downside risk if they don't sell enough tickets to support the cost of bringing the event to the theatre. It should be noted that neither Vancouver nor Victoria or other theatres have such series as the potential risk is just too risky! These events are different from events put on whereby an outside interest will simply rent the theatre for a rental fee and they assume all upside and downside risk associated with the event. The Presents Series also seems to have undergone some mis-management issues over the recent years with 2010 showing the first year a loss was actually incurred with the Theatre losing a whopping $48,091 on their Presents Series of shows. This compares with surpluses of as much as $41,919 during the four years preceding 2010. Clearly management has some explaining to do as to why 2010 was so poorly handled. Another fact revealed by the financials is the fact that in 2007 the cost of phone, utilities and building maintenance was $161,281 and only rose to $162,981 in 2010. I say 'only' because theatre management is explaining their need for more funding because of increases in these areas, which hardly seem to be running out of control. A decline in rental income is also another reason given for needing an increase in funding when in fact income from rentals and recovery income was at an all time high of $467,883 for the year of 2010 up sharply from $347,495 in 2006. Wages and benefits have also increased by $155,186 from 2006 - 2010 with no obvious reason such as increased business to support the increases given. An examination of managements contribution to this wage increase would be appropriate. In other words it would be interesting to determine if the % increase in wages is evenly spread over all employees, or if the management sector accounts for a larger percentage of the increase in wages and benefits. The application from the theatre is asking for "an increase in management fee to reflect rising costs of facility management". 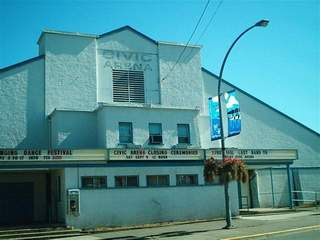 It should be noted that for the five year period the city grant to the theatre has risen from $408,000 in '06 to $445,247 in 2010. I presume the grant for the year 2011 is even higher. This indicates that the current agreement has in fact allowed for increased management fees on a regular basis. These are just some of the questions an examination of the Port Theatre financials raise, and it should be noted that city council will be asked to consider the city staff recommendation to allow for the transfer of funds from the capital fund to the operating fund to offset last years deficit. This is really just a smoke and mirrors move which looks like the city isn't providing extra 'operating' funds when in fact that is exactly what they are doing. According to the Theatre's records there should be a contingency fund in place designed to handle a crisis such as the Theatre is presently experiencing. This matter will be addressed at the FPCOW meeting this coming Monday and it will be interesting to see Council's response to the city staff recommendation. A matter of market forces or a matter of management? An issue YOUR City Council needs to determine before they spend YOUR tax dollars at the Port Theatre. This is NOT a matter of whether you support the arts community in Canada, but rather whether you support the way the current management is managing YOUR $550,000 every year. The above news feature aired on the CBC National last night should be required listening for all members of city council and all members of city staff and all members of the community of Nanaimo. These communities in California have finally hit the taxation wall, finding they have agreed to unsustainable levels of wages and benefits in the past, which now leave no money left to fund the services their communities used to enjoy. In Nov. 2010 Mr. Hickey presented city council with a report that indicates given historic levels of funding our water, sewer and roads are currently being underfunded by over $12,000,000.00 annually. At the time of that presentation, one of the suggestions for ways to deal with the problem was to reduce the levels of service the city has been providing. This report made the front page of the News Bulletin in Nov. 2010, but as usual the average taxpayer in Nanaimo, if they read the story at all;, simply yawned and went about their daily life. To put this funding shortfall into perspective, your taxes last year should have been raised 16% to cover this shortfall, and since they weren't should be raised double that this year. To be clear, that is the level of taxes that SHOULD be levied to insure our water, sewer and roads are being funded at historic levels. The explanation I got from the Finance Director in 2010 when I raised the question about why taxes were not increasing enough to cover this shortfall, was most unsatisfactory. I was told that because of the tax shift from industrial to residential, increasing taxes to cover the shortfall would not take place until 2013. That does not address the fact that water, sewer and roads ARE being underfunded, and that is one chicken that will raise hell, when it comes home to roost. I was hopeful, this new city council would take a more active role in directing staff in a fiscally responsible direction, but given the lack of input they have demonstrated when discussing the current financial plan prepared by city staff, I have lost all hope of that happening. As a matter of fact, it is becoming more and more of a mystery to me, when or if this city council EVER discusses or deliberates the matters they keep putting their rubber stamp upon. According to an advertisement in the 'Nanaimo Magazine' Feb. 2012 issue the number of delegate days booked at the Vancouver Island Conference Centre has increased by approximately 225% to 32,000 from only 13,919 in 2011. It seems that powerhouse manager Denise Tacon is putting Nanaimo on the conference map! Considering the Nanaimo taxpayer subsidized the company operating the centre last year by approximately $1,000,000 (not a precise figure) when they only had rental and catering revenue from approximately 14,000 delegate days a 225% increase must mean the centre is turning a considerably greater profit for the company now. In turn, this greater profit should provide a considerable saving for the Nanaimo taxpayer via a reduced subsidy. The amount of the saving isn't known at this time, but I have asked Mayor Ruttan to respond letting me know what the saving to Nanaimo taxpayers will be resulting from this 225% increase in attendance at the centre. If I am correct this is also the year, the current contract with the management company running the centre is up for renewal, and it will be interesting to see if the shrewd managers at city hall will be able to negotiate a much better deal in the new contract. Did you know, the city actually pays the management company a fee, every time they use the VICC? Stay tuned for more details as they are made available. At the City of Nanaimo council meeting on January 23, 2012 on staff's recommendation council approved awarding a contract to MWH Canada Inc for preliminary engineering services for South Fork II Dam. The value of the contracted amount is $460,000.00. Sounds like a reasonable amount as soon as you say 'engineering services' which we all know are in a stratosphere of their own. Now for the part that is a prime example of why city hall will never be serious about controlling spending. In addition to the agreed amount of $460,000, city staff recommended that council approve another $100,000 for a contingency should it be necessary to do other investigations. In other words, they had a contractor agree to do preliminary engineering work within established parameters and then have volunteered to give them another $100,000 just in case they may need more money to do the study!! That would be akin to me or you hiring a contractor to give me a price to build a garage, and after getting a price, offer to pay the contractor another 20% if they thought they needed to!! Only Councilors Bestwick, Kipp and McKay were opposed to the $100,000 contingency, with the balance of council thinking it was a sound financial decision. The recent effort by the city of Nanaimo to attract a new hotel to downtown Nanaimo by offering tax incentives is yet another example of how some tax sectors have paid all they can afford to pay. The move to reduce industrial tax rates over the coming years is yet another sign of the negative impacts of excessive taxation that we have become reliant on in past decades. Unless city councilors wake up, the same result will happen in the residential sector if continually taxing and spending is not brought into line, we are heading for an over taxation disaster in Nanaimo. We are headed for another 16% (at least) residential tax increase over the next four years, 20% increase in water rates in the same time period and who knows what other 'surprises' are lurking at city hall, waiting to be sprung on the already over stretched taxpayer. Municipalities have heard loud and clear from business and industry, that they are killing the goose that lays the golden egg with over taxation and municipalities are being FORCED to respond, or risk driving business out of town altogether. With the reality that business and industrial taxes must reduce, local government who are as dependent on taxing and spending as the drug addict is dependent on their next fix, have only one other source for their 'fix'. That is the unorganized, nearly naked goose who think their elected officials are looking out for them. The truth is, councilors just can't wrap their heads around the concept that this gravy train is nearly off the rails and the days of living in la la land where you simply raise more taxes to fund your latest boondoggle are pretty much over. All senior levels of government are wrestling with getting a grip on out of control spending, but local government on the advice of city hall management are still labouring under the illusion that the residential tax purse has no bottom. 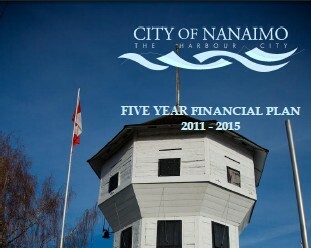 About this time every year city staff and city council present the Nanaimo taxpayers with a 'draft' five year financial plan. Up until the final plan is adopted in May the public is invited to offer input directly at city council meetings. Right about now a common refrain coming from city councilors and city staff goes something like: "we are doing our very best to hold the line on city taxes, but taxpayers must realize that it is they who are demanding the high level of services and they have to be funded by taxes", the average taxpayer is then invited to make suggestions as to which of these valued services they would like to see cut. Of course no one wants the basics like water, sewer, garbage pick up, fire protection or police protection reduced and council would like you to believe those are your only options. 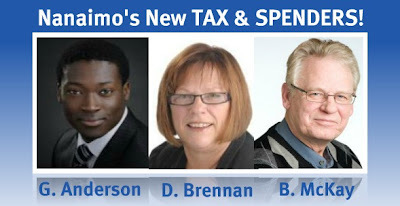 They never mention that over 60% of every tax dollar collected in Nanaimo is used to pay staff wages and benefits. They also never say that sometimes, hidden within the draft financial plan are planned expenditures they don't want the general public to know about until after the fact. For example last year at this time, the draft financial plan that came before the public made no mention of the the fact that $16 million was earmarked to build a new Annex (shiny new office for city staff), an amount that would equal the planned tax increase for 5 years. Had city council asked the Nanaimo taxpayer if they wanted to build a new Annex or see their taxes remain the same for the next five years, we may still have decided to build the Annex, or we may not have a need to raise our taxes for the next 4 - 5 years. However, we will never know, as the last city council and city staff had no intention of letting the Nanaimo taxpayer know how they intended to spend YOUR money. Only time will tell if this new financial plan contains any similar 'surprises' which will only be revealed after another of city council's famous in-camera meetings. Council upon city staff recommendation has approved the awarding of a contract to Rethink (West) Incorporated to develop a strategic plan to guide the city of Nanaimo forward. When staff looked at core review work done in other communities, one of the frequent recommendations of the consultant hired to undertake the review is that Council engage in a strategic planning process. The reason to do this is because without a strategic plan it is virtually impossible to structure an organization and decide on what priorities it should focus on (and what priorities, if any, it should stop putting resources to). In my view, there is no point doing a core review without first undertaking a strategic plan. The strategic plan will provide the necessary guidance as to the community‟s priorities to provide direction to any follow-up organizational or core review. Only when you know what you want to accomplish as an organization can you then address the question about how and when you want to get there. I therefore strongly urge Council to support this $100,000 funding allocation. I have put in bold type the parts of Mr. Kenning's rationale I found interesting which supported the developing of a strategic plan for the city. 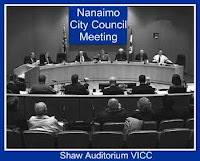 Am I the only one wondering how the $160,000,000.00 corporation of the city of Nanaimo, with it's 700+ employees and a payroll in excess of $55,000,000.00 has been structured to date WITHOUT A STRATEGIC PLAN!!! It makes the mind wobble ! In the January 5, 2012 issue of the Nanaimo Bulletin, Mayor Ruttan is asked whether the city can afford all of the projects being undertaken. His answer that because we have budgeted for them, therefore we can afford them strikes me as a little odd, or at least telling as to his logic. Simply becasue city staff recommends something and council rubber stamps it and puts it into a budget, does not mean the people paying the freight can actually afford it. He also went on to say "People say they want a zero increase and our response is always, 'OK, what are you prepared to give up first?'." This is the answer that I find difficult to take on face value when you consider how, this time last year, city staff and city council decided, behind closed doors to spend the equivalent of the next five years tax increases on a shiny new office for city staff. I suspect that had the Mayor asked taxpayers last year "OK, are you prepared to give up the shiny new office for city staff in exchange for zero tax increases for the next five years", we would have seen the existing Annex either left as is, or improved which would have eliminated the need for tax increases for either 4 or 5 years. To this day, you can't find out why council decided last year to be so generous with YOUR tax dollars! To say that we are ALWAYS asked what we are prepared to give up first is the answer that I would class as being deceitful or at the very least totally inaccurate. At the FPCOW meeting at city hall on Dec. 12, 2011 city hall staff presented the annual financial plan outlining the budget guesstimate for the next five years. Tucked away in the presentation is an item titled HSL (Higher Service Levels Requested) with the recommendation to fund "Seismic screening of City buildings"......... this is absolutley BRILLIANT and my hat is off to the senior bureaucrats at city hall with this one!!! ALL ABOARD........the Seismic Screening EXPRESS will be leaving the station sometime in the new year..... courtesy of Mr. Kenning, Mr. Holmes and the 25th council of the city of Nanaimo. In the first public airing of the 2012 - 2016 financial plan the city staff report indicates an impact of $94.24 on a typical single family dwelling in Nanaimo. The impact of $94.24 is based on a home with an assessed value of $350,000 and does not make any provision for tax increases for schools, hospital, RDN etc. The increase is a combination of another $71.41 in property taxes based on a 4% increase, $15.83 increase for water use and $7.00 for garbage. Of course all of these figures are very hypothetical as they are based on average values and average water consumption etc. but do give some idea of the type of tax increases we can expect next year. It should be noted this increase of 4% applies only to residential taxes with the 'blended' tax increase being 3% as commercial rates increase by 3% and industrial rates decline by -20%. Over the next few days watch this page for more detailed information on where and why your tax dollars are planned on being spent in the years to come. There are a couple of troubling details revealed in this draft financial plan. The most troubling is the 'Seismic Screening of City Buildings' being recommended by city manager Al Kenning. One such 'screening' saw the decision to spend $16 million on a shiny new staff office, instead of spending $4 million upgrading the existing annex. The most troubling aspect of this 'Seismic Screening' is the likelihood that it will result in huge sums of money being spent based on information that will be hidden from public view by the overused tool of 'in camera' decisions. Will This Council Be Any More Open? Given the fact that the new city council is made up of 5 incumbents and three out of four Nanaimo taxpayers couldn't be bothered voting, I am not too hopeful this new council will be any more open than they have been previously. Nor am I hopeful that any more than a handful of Nanaimo taxpayers will involve themselves with the business of the city and demonstrate a care for how our city is governed. When it comes to issues of major importance and usually major expenditures, city council and city staff much prefer to conduct our business in secret away from public scrutiny. The tool they use to accomplish this end is a little device called 'in camera' which means that basically anything they decide to do, and why they decided to do it, can be kept from public scrutiny for a period of 15 years. Did you know that? It came as a surprise to me also. Recent examples of how city council and city staff have kept the taxpayers of Nanaimo in the dark as to why they have chosen to spend our tax dollars was the half million dollar golden handshake given ex-city manager Mr. Berry, the Bestwick conflict of interest case and finally the decision to spend $16 million on a shiny new office for city staff. There are legitimate reasons why at certain stages the 'in camera' process should be engaged, however that does not mean a time does not come when the 'in camera' proceedings should be open to the public. How else can an engaged and involved taxpayer know how to assess the decision making process of our elected and non-elected officials? 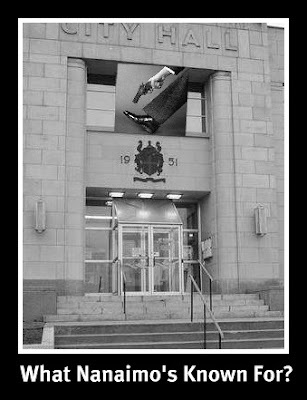 One reason I would presume city staff and city council would wish to avoid the scrutiny of the tax paying public, is if their decisions are questionable and as is the case of the new annex, self serving as well. On the matter of the new city hall annex, I have had to make a freedom of information request which has now progressed to the assigning of an investigator which will take several more months to resolve. All this, just to find out why this city hall management and the 24th city council felt it was a good idea to spend $16 million on a fancy new office for city staff at a time when our infrastructure is being seriously underfunded and taxes are constantly rising. The biggest question the secrecy behind the annex decision raises is "why are city councillors so afraid of telling us why they thought this was a good idea". The mayor is quoted as saying "if they had the luxury of time they might have done it differently", does that mean city staff was threatening an insurrection if they didn't get a new office or does he know when this massive earthquake is going to hit? 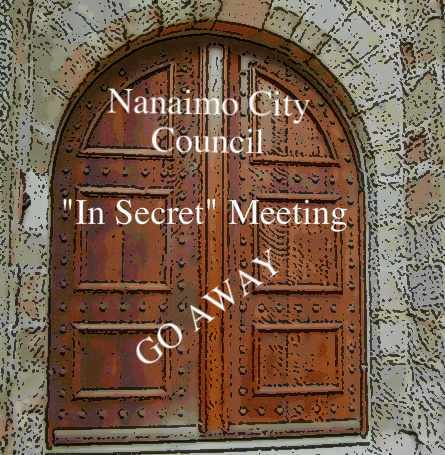 It will be interesting to see just how open and transparent the 25th city council of Nanaimo will prove to be. I for one am looking forward to a much greater degree of openness, but then again I am also looking forward to Santa coming down my chimney in a few more weeks. The Courthouse News Service reports that the telecom heavy weights consisting of Telus Communications, Rogers Communications and Bell Mobility have taken Nanaimo to the B.C. Supreme Court over the "Call Answer Levy" passed by council last November. They want the law tossed claiming Nanaimo has no authority to levy a tax of this sort saying Nanaimo is not authorized by any legislation to impose a tax on the Wireless Service Providers. They also claim that the bylaw creates a dangerous disincentive for callers to dial 9-1-1 within the municipal boundaries of Nanaimo. Comment: I am sure the capable lawyers engaged by the City of Nanaimo anticipated such a challenge and are confident Nanaimo will prevail during this challenge. It will be interesting to know the actual cost of this lawsuit to the Nanaimo taxpayers. The following is a letter I have sent to the Mayor and Council pointing out a few facts that our city manager or finance director are unlikely to make a big deal of. I doubt there will be anything more than the usual complete wall of silence from our elected officials, as that is their policy so that they will not reveal their knowledge, or lack there of, on matters of city business. I realize that having to attend public functions, and ride in parades, and kiss babies and shake peoples hands, would leave little time to scrutinize the business of the city. I also, realize that the business of running the city is entrusted to the fine team of professionals assembled over the years. Total earnings for the ‘top ten’ at city hall = $1,593,655.00. Of note is the fact that our very own city manager is in spot #39 out of 8181 public employees in the entire province. He must be extremely GOOD (except for that little VICC business) and we are certainly glad we snagged him when the position of city manager was open to competition. Imagine, we had #39 already hidden away at city hall. I forgot, that #39 is ranked for how much public funds they slurp up, not a level of competence. 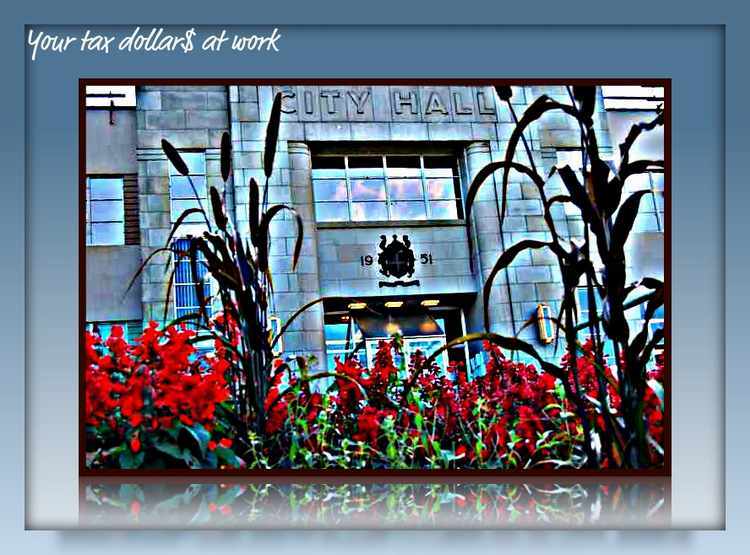 City staff wages and benefits consume 65.13% of EVERY TAX DOLLAR COLLECTED in the year. No, pipes in the ground, no water pumps bought, and certainly not enough left over to properly fund water, sewer and roads according to staffs own report. So, what in hell is the actual means of measuring proper stewardship over the public purse anyway?? Our top ten earners at city hall account for almost 2% of the entire taxes collected for the entire year, that is based on their total earnings of $1,593,655.00. The new staff office totals $16,000,000.00. we don’t know if that is a good price and God only knows why a $4 million upgrade wasn’t good enough. This represents 19.89% of the total taxes collected in one year. Total used for wages and benefits = 65.13 % of all taxes collected, new office accounts for 19.89% of all taxes collected, for a grand combined total of 85.02% of all taxes collected in one year. It certainly would make the average ‘thinking’ taxpayer wonder, just what in hell city councillors have been doing these past years?? At yesterdays FPCOW which saw even the public portion take 2 hours, followed by another in camera meeting, (which incidentally is a catered event) much of the discussion centered around the $62,000,000.00 water treatment plant. 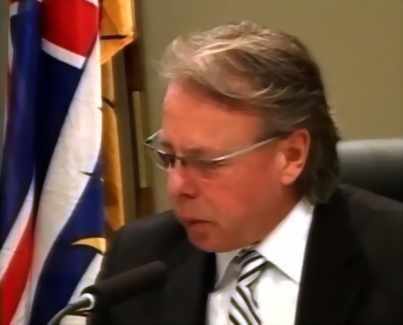 It seems that after spending several million dollars on the process now, city council was uncertain if it is absolutely necessary to proceed with, given the high quality of Nanaimo's drinking water. Currently council had agreed to ask the public if they want to borrow $22,000,000 to fund the plant, in a referendum to be included at the time of the civic election. Many councilors still seem unclear as to whether VIHA would really be in a position to force Nanaimo taxpayers to comply with their order to build this new $62 million plant. During the discussions Councillor Bestwick asked if the plant could be funded from reserves, instead of borrowing, and Mr. Kenning said that the new city annex had used up all available reserves. 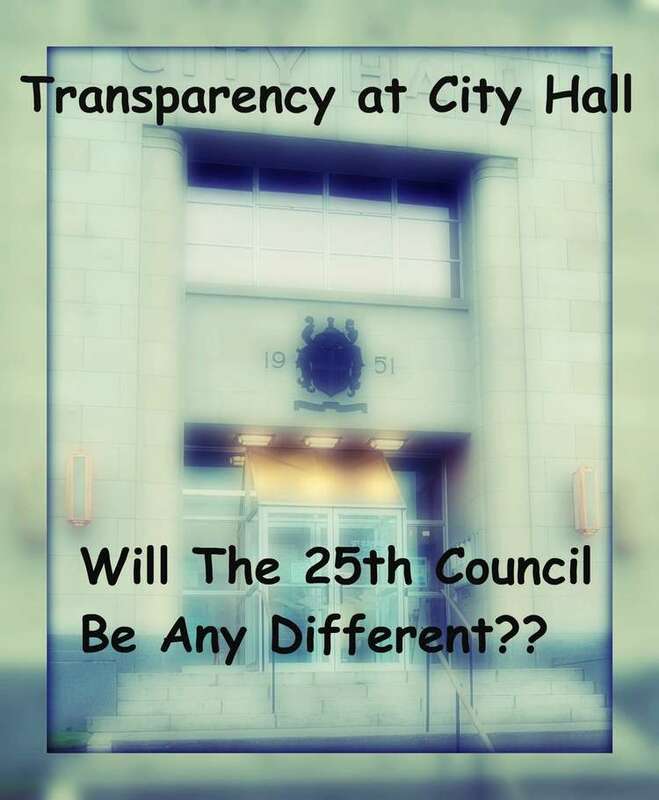 Councilor Johnstone also said she was uncomfortable with the idea of a referendum, as she felt the taxpayers would not support borrowing the $22,000,000. She did not explain what she meant by the comment, but it raises questions. If you think this city council needs to challenge VIHA's authority to impose such an onerous burden on Nanaimo taxpayers where our water is perfectly safe now, you should let your counilor know your feelings. An online petition to have this city council suspend the decision to spend $15.7 million to build a new annex for city staff invites Nanaimo taxpayers to make their wishes known to this council. 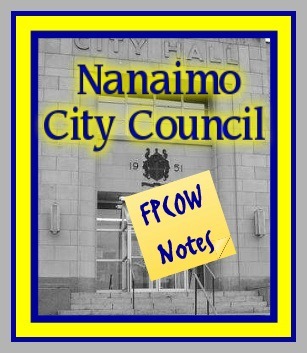 The petition declares that this City Council of Nanaimo has lost the confidence of the taxpayers of Nanaimo with their decision to spend $9 million more than what is required to provide a new building for city staff. This decision was made in secret and as of yet, the taxpayers of Nanaimo do not even know which councillors supported this waste of money. The petition demands that city council immediately suspend all building projects until a new council is elected this fall. In the meantime, $9 million should be applied to the reduction of city property taxes. We, the undersigned believe that the current Nanaimo City Council also known as the 24th City Council of the City of Nanaimo has lost the confidence of the taxpayers in the city of Nanaimo. Therefore we petition this council to instruct staff to suspend all plans to construct a new city hall annex at a cost of $15.7 million and immediately reduce city tax increases by an amount to reflect a $9 million reduction in spending. 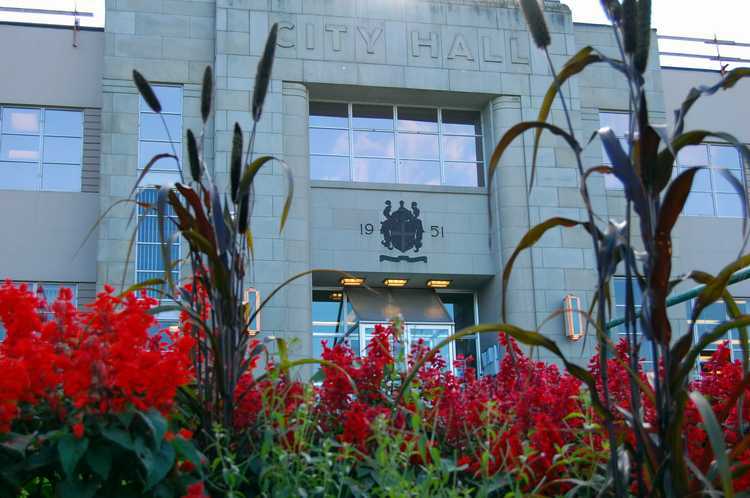 This would leave $6.7 million in reserve to fund the renovation of the existing annex, should the new city council choose to proceed with that project. We agree that the decision to build any new city owned buildings be immediately suspended until after the next civic election in the fall of 2011. You can add your name to this petition by clicking HERE. Why doesn’t City Council ask the taxpayers about this project, like in a referendum? Question? how does this answer the question about a referendum? How does this justify building a new building rather than repairs to the exisiting which clearly would save money? This Building Should Be Closed IMMEDIATELY! The city has declared in a public notice that this building is unsafe both for the staff working there, and any member of the public entering the building. Therefore in the interest of public safety and the safety of the staff this building MUST be closed without further delay! I make the following comments in all sincerity as someone who cares deeply not only for my community, but the community I will be leaving to my children and grandchildren, as I am sure do you all. What (other than pure optimism) makes any of you so certain there is no compelling reasons to reign in the amount of money city staff keeps taking out of the pockets of the average taxpayer in Nanaimo? I realize that it is actually staff that makes these decisions, and the average taxpaying ‘dupe’ thinks their council actually controls spending, but they do not. For example, should council actually be so bold as to insist that staff present a budget that would reflect zero tax increases, you will be presented with a list of ‘choices’ which are politically unpopular, so of course, no real cutting is made. Or the red herring that is always thrown out by staff and those on council complicit in the scheme is “ which one of YOUR services do you want to see cut?”. How come, city staff and council are not able to DEMONSTRATE to the tax paying public that we are in fact getting ANY bang for the buck with the decision to build another ivory tower for the burgeoning bureaucracy in Nanaimo? Why, if this is such a great idea, must council hide behind this veil of secrecy surrounding this decision to spend $15 million on a very questionable expenditure? Will your decisions (shepherded by staff) not withstand the public scrutiny it demands? To think that the average taxpayer is going to be forced to go through the FOI hoops just to see, what should be readily transparent, is quite distasteful. We are living in a community that now has 16% unemployment for the second month running, and NO ONE can tell you why we have twice the national and provincial average for jobless people. We have also for many years had the dubious honor of having among the highest rates of welfare recipients of any BC community. We are having to rely on charitable programs just to see our kids are getting fed in school, as their parents can’t do it at home, food banks and breakfast and lunch programs are all realities that this city council and city staff seem to be absolutely blind to. You may well say: ‘ we aren’t blind to such things, we support the 7-10 club and other agencies’, true enough you do throw a few pennies into the plate for the hungry, but then open the purses wide to build yet another monument to government excess fuelled by unbridled egos with incredible senses of entitlement and arrogance. You have had the opportunity to greatly reduce the property tax increase citizens are facing by scaling back the cost of the Annex upgrade (you have not proven necessary to the public) to the $4 – $6 million it would cost to upgrade thus saving the taxpayer $9 million in tax increases, or put the whole thing on a shelf for five years and revisit the issue to see if it really is needed. I realize that the little kings with their kingdoms at city hall, are absolutely gung-ho to blow off $15 million so they can sit in fancy, shiny new digs where they can tower over city hall, which of course is their rightful place in the community. But consider the possibility, that the unemployment rate in Nanaimo will NOT be turned around from the staggering 16% rate and those unemployed will have no choice but to move and seek employment elsewhere, remember Nanaimo’s jobless rate is TWICE the provincial average, so it is not exactly rocket science to figure sooner or later people will be forced to move to areas of greater job opportunity. What kind of a hole would an exodus of 4,000 put in your financial planning? When that happens, what makes council so certain, there will not be the need to reduce our civil service, simply because the demand created during our 10 year boom cycle has simply dried up and blown away. In fact what proof is there it shouldn’t be reduced right now? Don’t expect any recommendations in that area to come from a staff directed internal review. Anecdotally, my own son, daugher-in-law and granddaughter, had to move from Nanaimo to Victoria to find suitable employment and now are planning on moving once again to Alberta where the prospects are even brighter. That is just the reality of the modern mid-island economy. If you aren’t retired, with a bag of money, or work for government your prospects here are pretty bleak. I want desperately to see this community survive and thrive, not for my generation (I too have suckled the teat of prosperity during my life) but for those to come. The only opportunity that Nanaimo currently holds out is working for the government in one form or another, and we all know that governments at all levels have no money of their own. The small businesses in Nanaimo, with few exceptions, are truly struggling and many are a hair’s breadth away from closing their doors. As are many ‘working’ families, who are one pay cheque away from financial ruin. This is not just doom and gloom, it is harsh reality seldom faced until it is too late. I want very much to think the elected civic officials are sound managers of the cities affairs, worthy of the public trust who gladly make their decisions open and transparent so that the community may place it’s faith and trust in their decisions. Sadly, that has not proven to be the case with this council. 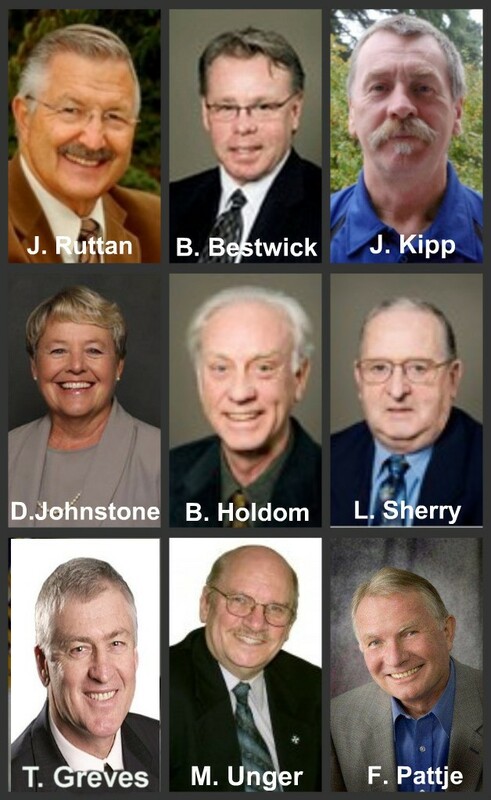 The even sadder reality, is that a change of council, will not change anything as Nanaimo like most of Canada is ruled by the unelected civil employees first, who simply lead those elected here and there, to an fro as you lead a steer with a ring through it’s nose. Any with a farm boy background knows why the reference was to a steer and not a bull. On a personal level, my personality is likely a cross between Polly Anna and Don Quixote and on the one hand I am always trying to see the positive in all things, while at the same time I am compelled to joust with windmills. Realizing of course, that in reality, those in the windmills receiving this note, will simply, smile and nod and then continue on as they always have. In closing, I compel those on city council and city staff to take a sombre, sober, serious second look at how you are planning on spending another 15 million tax dollars, remembering of course that the pool from which you plan to finance our failing infrastructure ($12 million annual shortfall), multi million dollar water plant, etc. etc., is not ever expanding, and in fact in the harsh light of day would appear to be shrinking daily before our eyes. Eight percent unemployed in Nanaimo in January of this year, exploded to 16% in March, when 4000 more people came into the unemployment line and holding at 16.3% for April, with no realistic prospect on the horizon to provide those jobs. And no one seems to be taking it seriously. Just stick our heads in the sand and keep on taxing and spending, spending and taxing as if there were no tomorrow. Perhaps, our generation who has never seen any real adversity simply can’t face reality, and so we keep going about re-arranging the deck chairs on the Titanic, and nothing will change until we hit the ice berg. I hope there is still enough left in city coffers to spring for a lifeboat! Don't let all those smiling faces fool you. Don't let claims of wanting to hold the line on taxes and being open and transparent fool you either. Forget what any of these Councillors have to say, and just focus on what they DO! $500,000 Paid to former city manager Jerry Berry because he wanted to go golfing two years before he qualified for pension. Can anyone except the Mayor talk about it? No, the rest of city council and city staff are all under a gag order from the Mayor on this one. Is that because there may be some different versions of The Truth, if councillors were actually free to speak? You would have to ask them, but don't expect an answer. $1,000's spent on legal fees during the 'Bestwick' conflict of interest case. Funny, though how city council would not release the legal 'opinion' they acted upon, nor would they release the contrary 'opinion' Bestwick's lawyer provided. Once again, how can you weigh the judgment of this council, if you have no idea how they make their decisions. $15,000,000.00 to build a new city annex to house city staff when it is questionable if there is any real urgent or pressing need to do anything with the existing building. Even if it is actually necessary, why not spend the $6.5 million the original engineers report (which is also secret) claimed would bring the building up to seismic standards. According to published reports, every $750,000 the city spends represents another 1% increase in property taxes. Therefore the planned increase from 2011 - 2015 of 20% could be eliminated if the $15,000,000 were not being spent on this questionable building. If this new annex is the best bang for the burdened taxpayers buck, then why in HE (double hockey sticks) are city councillors unwilling to tell the public how they voted on this expenditure? Why is there no intention to demonstrate to the public any expense is actually needed, and if anything is needed doing, why fixing the existing building is not the best option? Why has this whole deal been designed to avoid public scrutiny? The building is only 3 storeys, requiring no need for public input. Yet you might argue a four or five storey building would give a bigger bang for the buck. Of course that might require letting the public know what you are up to. The loan of $4,000,000 (why borrow $4 million, when we have surplus) does not require a referendum, which of course would trigger public involvement once again. Why was this whole decision pushed through 'in secret' behind closed doors unless those 'spend crazed' councillors and staff know it would never fly if it were subject to the glare of public scrutiny. IN THE WAY THEY SPEND YOUR MONEY! Meeting convened at 7:00 pm, May 2, 2011 in Shaw Auditorium in the Vancouver Island Conference Centre. Residential Taxes: your residential taxes will be increasing 3.6% this year (city tax portion only) and is budgeted to increase nearly 20% in the years 2011 - 2015. User Fee Increases: your sewer rates will remain the same, while your water rate will increase 5% and your garbage/recycling fee will increase 1.8%. Average Total Increase: If you lived in an average $350,000 home which had increased in appraised value by the average increase in Nanaimo you would be looking at a total increase in your taxes and water, sewer and garbage rates of $79.39 per year. New Water Treatment Plant: the preliminary design cost estimate for the new water treatment plant the city is being forced to install by senior government (without much assistance from senior government for funding) is estimated to have a total capital cost of $65 million. The plant is designed to be able to deliver 116 million litres of treated water per day, which is the estimated demand for the city of Nanaimo by the year 2035. New City Staff Home: city council approved the expenditure of just over $15 milllion which will provide a new annex for city hall staff. The new building is being built by Windley Construction and is expected to be complete by the fall of 2013. It will be built at 411 Dunsmuir Street which is directly across the street from city hall. It was not reported what the end fate of the current annex will be. Apply Surplus: local city hall watch dog, Mr. Fred Taylor asked council why they chose to 'bank' a $2.7 million surplus rather than use it to give the taxpayer a zero percent tax hike this year. Council was silent on this point, which is true to form. Costco: was successful in their bid to have a covenant removed from the location they operate from which enables them to now sell eye wear and hearing aids. They were originally restricted from selling these items when they first opened their warehouse in the current location. One factor Mayor Ruttan explained for granting the application was the fact, the new Costco in Comox will be offering these products, and customers are likely to simply leave Nanaimo if they are not available at the local store. Zoning Applications Defeated: several applications to rezone land in several single family areas to allow for the construction of duplexes and triplexes were defeated by council. It would seem that the concerns of the neighbours was taken to heart by council when making their decisions. Recently Council passed a motion putting into motion the formation of a new corporation charged with the economic development of Nanaimo at a cost to taxpayers of nearly $1.5 million. Question?? Why did no one on council consider restricting the cost of tax dollars going to this corporation to the cost of securing the CEO and his staff? Then leave it to him/her to establish an operating budget which would then be considered. Who knows it might cost the taxpayer less. If you want to know why this council will not reduce your taxes, you have a prime example of their rationale on display with this recent decision. This was a marathon meeting that continued beyond 11:00 pm which unfortunately meant I was unable to witness the conclusion as Shaw suspended it's broadcast at 11:00 pm sharp! There were many items on the agenda, but the one which dominated the meeting was the fate of residents living in Resort on the Lake on Arbot Road. This is a first class mess and a project that previous council and staff have allowed to morph into a real nightmare for the residents of the 'campground'. The owners of this property are now wishing to develop the land and turn it into a strata development which is causing many sleepless nights for the residents who thought they had found a retirement home they could afford and a pleasant lifestyle to enjoy in quiet contentment. The history of this disaster could be the subject of a civic handbook of error, or the poster child for what happens when politicians and city staff seem to allow a developer to simply run a muck and do whatever they please, regardless of how the land was zoned. The 'short' version of what I see has happened here, is a developer pulled the wool over the eyes of council and city staff on many, many occasions and to this point has not had any consequence. Questionable building permits were issued, decks and additions have been built and it seems a blind eye has been turned over and over again. It looks much like the level of ineptness displayed with the handling of the whole convention centre affair. How this council will ever untangle this mess and see the innocent people who now face the possibility of being kicked out of the 'campground' which they for all intents considered a retirement mobile home park, remains to be seen. Previous councils and city managers, may smuggly pat themselves on the back and feel elevated by their position in the community, but it is becoming ever more clear, they passed their competence levels long ago. Their reward?? Some got half million dollar golden handshakes! Ex mayor Mr. Korpan has called for public disclosure of the legal opinion Bestwick got during the BP sign variance saga. Council decided not to make these documents public. Mayor Ruttan says that Council's decision was to not release the legal opinions, as they relate to other legal matters and therefore could be prejudicial. For that reason, we are unable to elaborate further he replied. This was in response to an email from former Mayor Gary Korpan requesting that the legal opinions Council acted upon in the matter should be made public. The opinions expressed by the city's legal counsel led to the alleged conflict of interest issue with Councilor Bestwick and the Boston Pizza sign. Councilor Bestwick obtained $14,000 in legal advice which city council agreed to pay most of, agreeing to reimburse Councilor Bestwick $10,000. Notes from the Finance / Policy Committee of the Whole Meeting held at city hall on Feb. 7,2011. It was pretty much a full house for this meeting which had a pretty 'meaty' agenda with Director of Finance, Mr. B. Clemens giving a power point presentation regarding budget methods. During the presentation Mr. Clemens was outlining some new methods being considered to help evaluate how city staff is using tax dollars to deliver services the taxpayers seem to want. Mr. Hickey explained that members of city staff had attended at the Shu Pack company plant to see the progress being made on the split packer garbage truck the city is waiting for to be used with the already implemented kitchen waste pick up program. Council agreed to the staff recommendation that the city place an order for 3 more of the $300,000 trucks which will allow the city to take the kitchen waste program city wide this coming fall. After some discussion council agreed to expend $29,151 for a traffic signal connected to the Bowen Road widening project. They also agreed to a $39,940 expense to hire Archaidia Landscaping to see that the landscape contract associated with the same project is completed to specifications set out in the contract with the landscape contractor doing the work. A delegation from the 300 block of Hillcrest Ave. made a presentation to council wanting to have the new parking regulations near VIU include their street as well. Council and staff agreed with the delegation and have made changes to extend the area to be included in the new parking zone near Vancouver Island University. There have been parking 'issues' for a long time with residents having to compete with VIU students for parking in the residential areas adjacent the university. The question about the amount of times city staff relies on, and spends taxpayer dollars on consultants in the decision making process was the topic of some discussion. For example city staff includes people who you would think capable of determining if landscaping had been done properly, yet they have chosen to spend nearly $40,000 to hire a consultant. The cost of hiring a consultant to direct staff on the parking issue near VIU was also raised with the logic being that staff should be more aware of the problem than a hired consultant from Vancouver. Councilor Bill Bestwick had requested that Council reimburse his legal fees totaling $14,392.27 which he incurred as a result of the alleged conflict of interest involving the contentious Boston Pizza Sign. Councilor Bestwick of course removed himself from the room for the debate deciding whether to pay his legal fees or not. Councilor Unger at one point said he would support a motion to pay $2800.00 of the fee which is an equivalent amount said the city solictor charged for advice on the matter. 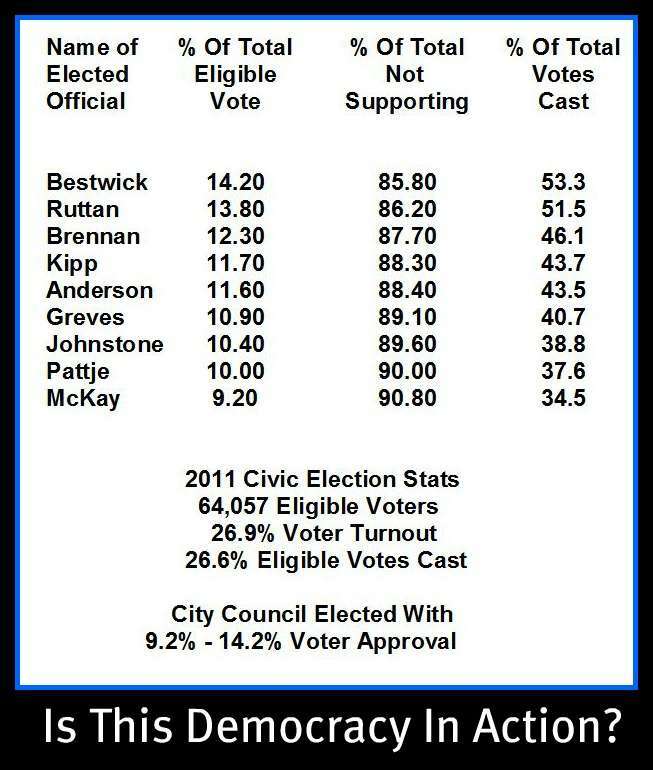 At the end of the day all of council with the exception of Councilor Pattje voted to reimburse Councilor Bestwick $10,000 to offset his legal fees. The discussion by council included the fact that whether Mr. Bestwick was actually in conflict was never decided by a Judge and in fact Bestwick had legal advice saying he was not in conflict. The whole issue of whether Bestwick was in conflict had a certain 'taint' about it and will not be remembered as one of Council's better decisions. The fact that a Councilor being paid less than $30,000 could be forced to spend thousands and thousands defending himself against questionable charges begs the question of who in their right mind would want to volunteer to serve their community in the present political climate? Councilor Kipp got little traction in his effort to see an independent analysis of the core services provided by city hall. 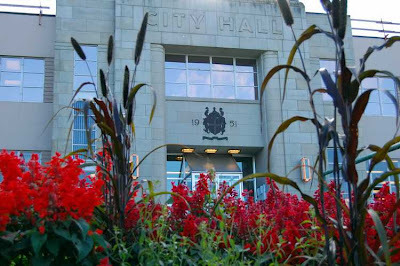 It seems the majority of council are content with allowing city hall staff to evaluate their own performance and Councilors Kipp, Sherry and Bestwick were the only ones in favour of hiring an outside consultant to review operations at city hall. At the end of the day city staff's recommendation to not hire a consultant effectively puts an end to the desire by Kipp to have fresh eyes evaluate how the core services are being provided by city hall. He feels such a review could provide valuable direction for future councils who will be charged with managing the city's affairs into the future. Council would seem to be at odds with the 126 people who have participated in this sites survey regarding hiring an outside consultant to evaluate city hall function. This brief reader survey shows 80% of participants feel an independent review is the way to go. If you have not participated in the study the form is in the right hand column of this page. The lengthy debate on the LED sign issue clearly demonstrated two things, one is the need for a tie breaking vote on council and the complete inability for this council to come to a consensus on this issue. 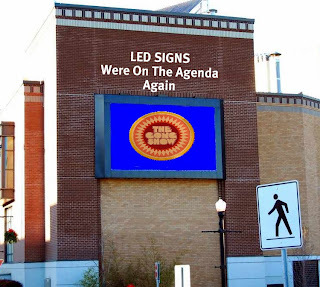 In spite of a well researched and delivered presentation by Bill McKay from Signage which clearly demonstrates the advantages of the LED sign technology and the urging of Chamber of Commerce spokeswoman Andrea Rosato-Taylor to not adopt option #3 as presented by staff; council debated for nearly an hour and basically refused all three options presented to them. It was only when they decided to 'revisit' one of the already defeated options that they agreed on option #3 which basically is not really much of a choice at all. It was either that or once again debate this issue ad nauseam without coming to a decision, which would make them look not just a little foolish. Council only passed option #3 out of sheer desperation and only after 'reconsideration' was the option, did option 3 actually pass. Option #2 could have succeeded if it had been voted on again as Councilor Johnstone indicated she would change her vote if Option #2 were reconsidered. Not being an expert on Parliamentary procedure I am unclear why Option #2 could not have been treated the same way that Option #3 was, before finally passing. Confused? So was council and anyone watching. "The disadvantage of Option 3 is related to "business friendliness" as it will require a political process with public involvement and comes with an expectation that Staff will negotiate, based on established signage criteria, safety issues and overall visual identity issues. This could involve lengthy negotiations and may involve MOTI and supporting documentation.studies being provided by the applicant." So, in spite of claims of being business friendly this council could only agree on the option described as being unfriendly to business because of the resulting lengthy negotiations which will be involved in the process. Basically no business will know in advance if they qualify for an LED sign permit without taking the time and spending the money to wade through another red tape laden city hall process. It is kind of ironic as the Economic Development Strategy Report recently commissioned by the city points out the problem with city hall red tape as an impediment to our economic development. Comment: After watching the wrangling and hand wringing and beard scratching this council has gone through dealing or not dealing with this issue, you would have to wonder who in their right mind would want this bunch making a decision on an LED sign application. It seems it would be an exercise in sheer frustration for any business person. As an aside, did you notice how the option which staff seemed to favour was the only one that seemed to be the easiest to understand? Guiding Compass or Dust Collector?? City Council and city staff have yet another document to guide their decisions as they try and plot a course for Nanaimo into the future. 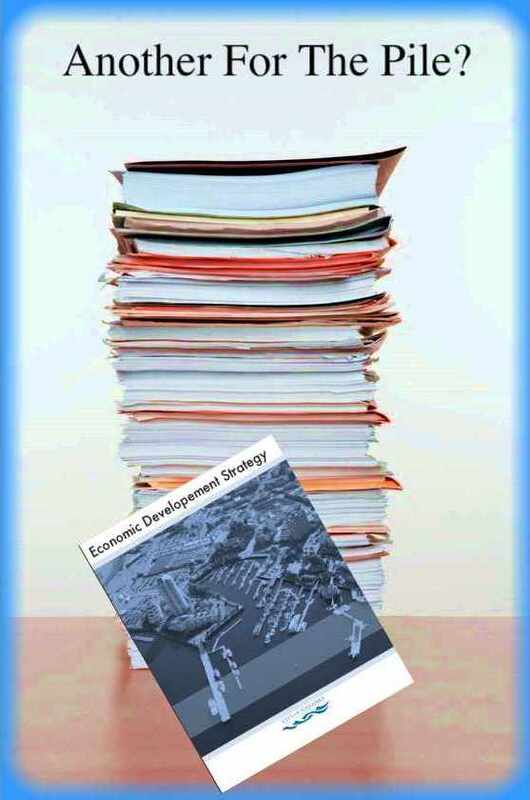 The 103 page report prepared by EDCD Consulting for many thousands of tax dollars contains the usual abundant verbiage you would expect from such a report. Lots of graphs and statistical data which may just as easily confuse as clarify. It is likely wrong to think that a couple of consultants living on the lower mainland can really plot an economic course to give direction to Nanaimo that our local pool of intelligence could not. After all, we do have all that high priced senior management staff at city hall we should be leveraging first, don't you think. Given their considerable experience leading us into the convention business I am sure they know of ample resources to make sound business decisions for the future of our community. Why it is necessary to pay thousands to another consulting firm to assemble what any business person of reasonable intelligence could do makes one wonder. It should come as no surprise that their first suggestion, which will be embraced by council and city staff, is to create yet another bureaucracy to assemble a group of navel gazers to produce yet more and more reams of reports to be added to the pile. Expect strong support for a downtown hotel which will surely kick start the lagging convention business and equally as strong support to develop more marketing plans to harness the economic engine of the cruise ship industry. It seems to go unnoticed that both of these industries are in decline and given current economic reality are not likely to recover soon. Typical of these reports it seems the authors seem to justify their fees based upon the size of the report, the number of words used and the sheer weight of the finished volume. It does however, lack the five point, concise overview which clearly spells out the studies findings. 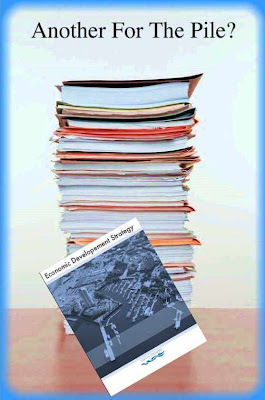 To download your own copy of the Economic Development Strategy click here.